Living rooms can be truly multi-purpose areas – especially after children come along. This post has been written to give you some ideas of how you can make a living room a place that is suitable for children during the day – with toys accessible, and suitable for adults at night – with toys hidden so that the grown ups can relax. I hope it helps! Not many of use are fortunate enough to have space for a separate family / playroom – and as such your living room needs to serve the functions of these AND still manage to be a relaxing haven in the evenings. There’s nothing less relaxing than feeling like you’re sitting in a toy shop / nursery etc….! I was recently asked by a reader on Facebook (thanks Kirsty!) 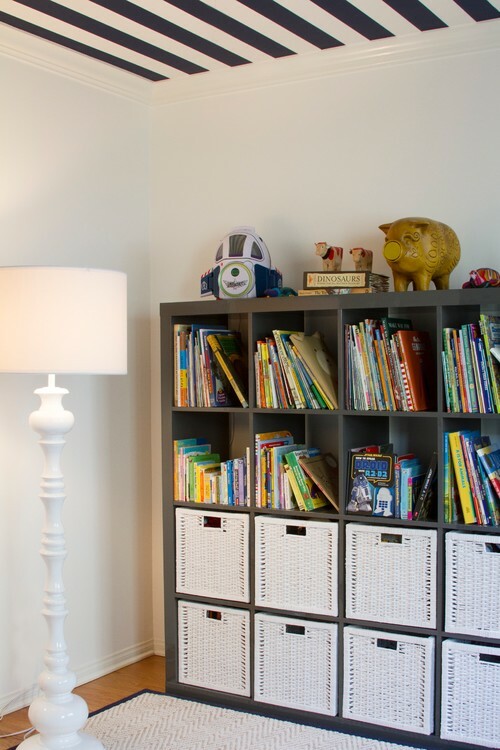 about this dilemma and so I wanted to give you my top ideas for creating a truly multi-purpose space that works equally well for kids and adults – after all – it’s a family home! As with anything I organise, I assess the problem and the space first. Working out where you are right now is crucial to getting a system that works for you at the end of the process. You want to understand the space you have available, and what you need to store in that space – so let’s tackle the latter first. However large your home is, there may be alternatives to keeping all the toys in your living room, and it’s worth exploring these first so that you are sure that you are organising the toys in the best possible place. Is there a space in your kitchen/dining room for a corner to be dedicated to a childrens area? This gives your children a place to call their own in the house – and if you are wanting to clear the toys from the living room each evening, having a place that’s theirs elsewhere will make this as easier thing to do – and stop them from feeling too sidelined. Do you have a guest bedroom? Could this double up as a playroom or at least storage for toys that are used less often? Do you have more than one child and do they have separate bedrooms? Could they share a room for sleeping and then use the other for a playroom? Do all toys have to be stored so that they are accessible all the time to the children? Sometime its really valuable to rotate toys so that children play with their things more as they have less choice – you can therefore store things in a loft for example and change the toys over regularly. Another idea for storing toys while they are not needed is to have a storage bed in your childs room – this keeps everything out of the way but easy for you to grab. If your child loves craft/art you may not actually want this type of play in your living room – so you may want to store this elsewhere so they are not tempted to get the paints out on your sofa! – A kitchen cupboard or even the garage are good places for these sorts of items as they are usually brought out by an adult for supervised play only so can be kept a little more out of the way. One thing I would say is that toys are usually best stored outside of childrens bedrooms if possible, especially when they are younger. This is because they are far too tempted to play instead of sleep – and having a toy in their bedroom makes relaxing that much harder – so if at all possible storing toys in a living room makes much more sense (you also end up having your children playing in more social areas as a result, so it’s easier to keep an eye on them during the day). You may now have a couple of extra areas that you want to keep certain toys in, and so will have less to store in your living room as a result. Sorting through in this way means that you can be more sure that what you have left is all you need to find space for in your living room – and so that’s what we need to organise! In a playroom it’s perfectly reasonable to have storage that is bright, open and fun to look at – as we are looking at making that into a kid friendly space – but when looking at storing kids toys in a living room we have a slightly different specification. You will want to have storage that can hide the toys away at night, that can easily be used by your children, but also that looks good when the toys are stored away. #1 – Baskets – large wicker ones, smaller ones in different colours, trunks etc…. I love using large wicker trunks** as coffee tables or along a wall for extra seating (add cushions!) as they allow loads of storage for toys, are really easy to open for children, and look great in a lot of different styled rooms. A lot of living rooms that double up as playrooms avoid coffee tables as they can get in the way of playing – but having a flat surface to play board games, draw etc… on can be a really good addition to the room (while also allowing the adults to have a coffee table! ), and you can keep loads of toys in the storage underneath as well. TIP – if you are worried about sharp edges and little heads banging on them, then you should look at storage footstools as this offers a pretty flat surface, storage, and extra seat, and if you add a large tray on the top you can use for a coffee table as well. There are loads of coffee tables/footstools out there that offer both functionality (an extra seat, somewhere to put your drinks etc…) and practicality in terms of storage. Whatever the look and feel of your home you can find something to suit – and the beauty of this is that you can simply put all the toys in there at the end of the day and is all hidden away – perfect! 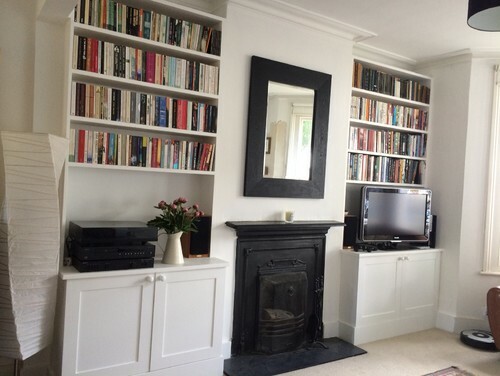 If you have a period home, then you may be blessed with alcoves around your fireplace in your living room – and you may as well maximise their use with some well planned storage! Most of us have out sofas tight against the wall – usually because the living room can feel small otherwise. However, if you do have a little more space – look to move the sofa out a little and then you can house toys behind it more easily – out of the way enough! Although – always look at where the sofa is positioned, as the last thing you want to be able to see when you walk into the room is the mess of toys behind the sofa! (I would use tubs or baskets to house the toys as well of course!). I hope that these storage ideas for toys have been useful to ensuring that you make the most of your multi-functional living room. Determine where is best to store the toys – do you want to store some elsewhere? Determine what toys you really need to store – can you declutter? Work out the best storage for the space you have in your living room so that things are hidden but accessible. Once you’ve done these 3 things you should have the ideal multi functional room that your kids think is a playroom, but reverts back to a relaxing haven for you come the evening – perfect! Do you have your kids toys stored in your main living room? What do you use to keep it all tidy? Let me know in the comments below…. Hi, great suggestions! We are in a 2 bedroom apartment that’s small. I wanted to get a 3 teir set to put plastic bins in. Can you recommend one that’s under 50.00? I’ve been looking but the ones that would work are to pricey. You mentioned a footstool which would also be great! But not all toys would fit. We got rid of the coffee table after my 23 month winded up getting stitches then a fat lip, we got rid of it immediat ly. We do need a coffee table. I’m not sure, maybe get both? Any suggestions would be great! My house already crowded with kids toys. Thanks for sharing ideas to organize kids toys in living room. It will be a great solution to cover all kids toys. My son is just a few months old and although i do not have this problem at present, i know what was said in this article could help n organizing his stuff n the future.